We see it all the time: companies attempting to reinvent the wheel, defining their own measures of maintenance performance, creating their own coding systems for equipment tags, failure codes, etc. This process may take months, sometimes years, and lead to very unsatisfactory results. It is particularly obvious when implementing maintenance management systems (either paper-based, “visual management” panels, Excel/Access developments or full CMMS) or when negotiating maintenance outsourcing contracts (where performance criteria have to be defined). Most people do not realize that very mature international standards exist, which – with some common sense – are perfectly applicable to China. It is however not easy to navigate between the various standards. At Siveco, most of our work is based on standards, although we often don’t even say it. The word “maintenance” itself is already defined by international standards – useful when most people still think that maintenance is about repairing broken machinery. 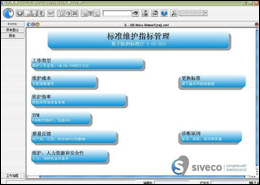 In this short paper, we will only discuss the three standards that Siveco China most often explicitly use, i.e. we inform our clients that we use them and explain why. 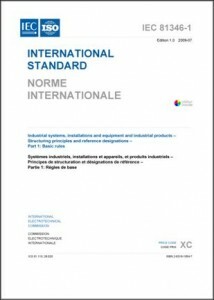 The International Electrotechnical Commission (IEC standards) and the European Union (EN standards) are two well-recognized international agencies. It is worth noting that China is a full member of the IEC and has pledged to implement all its standards nationally (mostly in relation to product conformity, which is none of our concerns today). IEC 81346, Principle for structure handling (Industrial systems, Installations and Equipment and Industrial Products — Structuring Principles and Reference Designations). This joint IEC/ISO standard defines how to name or code plant objects (equipment). Chinese engineers working with power plants may be familiar with the German KKS standard, which is now integrated in IEC 81346. EN 15341, Maintenance, Maintenance Key Performance Indicators. This European standard defines how to measure maintenance performance. It covers far more than you can imagine. As part of a joint project conducted in 2007 in directly partnership with leading academics, Siveco China has translated the EN 15341 standard into an easy-to-use graphical format, bilingual English/Chinese, which we market as an add-on module to our CMMS COSWIN. The utilization of this module cuts down the time spent on discussing performance measures to almost nothing, provides a library of KPIs and reports from which users can pick and chose as and when needed, and allows managers to explore new, previously unknown, ways to analyze their maintenance activity. EN 13269, Maintenance, Guideline on preparation of maintenance contracts. This European standard is typically used by Siveco when we involve in the selection of service suppliers or advise clients in their contractors management process. It defines what maintenance contracts should include and how to measure their performance. This standard is especially useful in a country where maintenance outsourcing is still very uncommon, where both suppliers and plant owners lack experience and where the regulatory and legal framework is not yet in place. Other standards of value include those covering maintenance methodologies, such as root cause analysis, FMECA and RCM. (1) We do not recommend you to go and read international standards. Most are not that easy to read and likely to bring a lot of confusion. They are also expensive to purchase and not available in Chinese. (2) Maintenance standards are just frameworks, to be adapted and often simplified. To do this, it takes someone well-versed in their utilization and the problems at hand (know-how of a specific industry and of maintenance in China). (3) Standards defining a methodology are best applied through the use of a CMMS, which will bring a more “concrete” aspect to what would otherwise be perceived as mere theory. The utilization of the CMMS will allow your maintenance team to live those principles on a daily basis, ensuring their implementation. Based on our experience for example, the question of equipment coding (and application of related standards) is more critical to infrastructure projects with a large number of complex inter-related assets. For manufacturing plants, a simpler coding system can be created just a few hours by an experienced maintenance specialist (still in compliance with standards). For smaller companies, which often lack well-established corporate guidelines and resources compared to large infrastructure owners, the questions of performance measures and maintenance contracts are more acute. Some very large multinationals may have corporate guidelines, but as far as maintenance is concerned this is the exception rather than the rule, even among global Fortune 100 companies. - To provide legitimate content for otherwise “empty shell” CMMS projects implemented by IT companies without understanding of industrial maintenance. - To cut down the time spent thinking, discussing and creating your own standards, from weeks or months to almost nothing. Instead, to allow you to focus on the result you want to obtain. - To fulfill the need for a credible, recognized, respected framework which Chinese engineers naturally crave for, as they lack the experience of their Western counterparts.